"JI, ayiye. Khana, khana" (Sir, come on. Here is food"), says the youth clad in a red shirt, holding a plate of hot food in one hand and a bottle of water in the other. The face of the old man, which has visible signs of long years of suffering, lights up, child-like, on hearing this warm offer. Lifting his head from a reclining posture, he accepts the food, and raises his hand in a manner of blessing the giver. The scene is Bypass Road in Madurai. 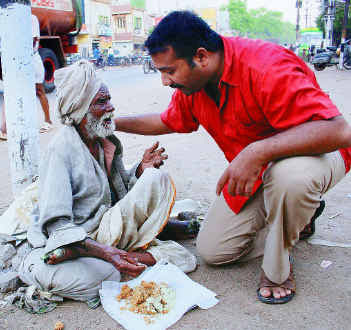 The food provider is N. Krishnan, a graduate in Hotel Management and Catering Science, who has taken upon himself the mission of feeding abandoned people - mentally unstable ones and destitutes. The recent drive against beggars undertaken by the city police following an order of the Madurai Bench of the Madras High Court has spared the population of abandoned people. Yet the move has affected Krishnan's mission in a big way. Donors, who used to contribute anything from Rs.10 to Rs.4,500, have withdrawn this gesture under the impression that Madurai's streets are bereft of the deprived. Krishnan makes three trips a day in his van, donated by the Life Insurance Corporation of India, to provide breakfast, lunch and dinner to about 200 people, including 50 women. Krishnan and three others cook the food. The beneficiaries of Akshaya Trust, started by Krishnan in 2002, are not beggars. For them food or money means nothing. Some are able-bodied but many are on their last legs. For them, a garbage dump or even a sewage drain would have provided something to fill their stomachs. "I have seen people eat dead rats," he once told me. Many of these abandoned people have lost their sense of identity. They cannot remember who they are or where they belong. Krishnan has a name for each of them. `China Bhai' (a person believed to have come from Nepal), `Ganapathi Ayya', `Dhamu Ayya', `Moorthy', `Manickam' and `Shailaja' are some of the identities he has provided for them. About 50 per cent of the destitutes are from North India. These people were perhaps brought by their families on a pilgrimage to southern Tamil Nadu and abandoned near temples. Only one person among them is able to recollect that he is from Indore. Baburaj from Kozhikode in Kerala is a platform dweller on West Veli Street. An accident victim, he had nowhere to go after he was discharged from the Government Rajaji Hospital. The condition of abandoned women is a shame on the city. "I can only provide them food, not protection," says Krishnan. Besides food, Krishnan carries a pair of scissors and a comb. He provides a hair cut for his "adopted family". Krishnan confines his noble service to the Madurai Corporation limits although there are disadvantaged people roaming on the city's peripheries. As in life, their death is also not dignified. The bodies of the old and infirm are left on the roadside. Krishnan has performed the last rites of at least 12 persons so far. The youth wants to create a rehabilitation home. He has purchased a four-acre plot with his own funds and donations provided by Infosys and T.V. Sundaram Iyengar and Sons. The blueprint for the Rs.45-lakh project is ready.